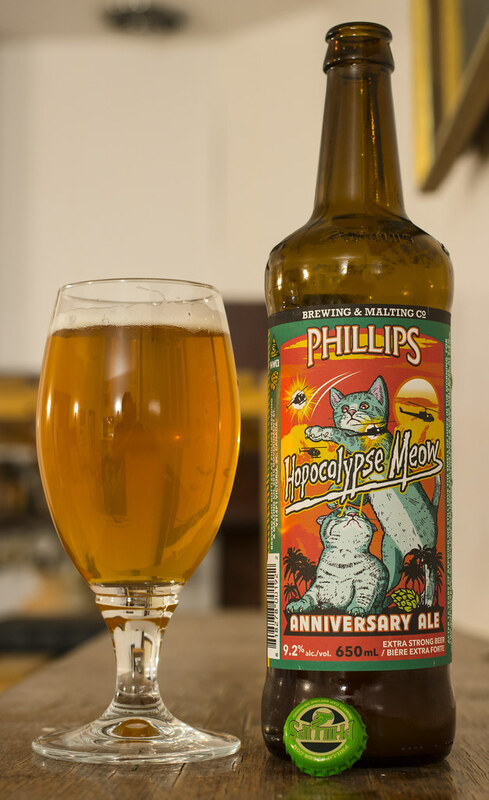 The folks over at Phillips Brewing are celebrating their 16th anniversary - for their sweet 16, they are releasing Hopocalypse Meow, an Imperial IPA at 9.2% featuring tropical hops and a crisp maltiness. Appearance: Golden ale with a light amount of sediment floating everywhere, fairly light amount of beige-white head on top, minimal carbonation. Aroma: Malt-forward IPA with notes of caramel, a good amount of booziness, lemon, and a good amount of bitterness from the hops - pine, some woodiness, and a hint of tropical fruit in there.. somewhere. Overall Thoughts: Seeing that this beer sold out near immediately at my local liquor store, I would have expected that this would have been something worth aging. Unfortunately, this isn't. This is an Imperial IPA with a good deal of hop bitterness, a bit of citrusness here and there, but insanely underwhelming. Since this is an "anniversary ale", this is a serious pass. The "Super Cooper" from a few years back should've just been re-released and been this year's anniversary ale - that one was decent.